Weekend vote: How do your pegs affect your ability to tune your fiddle? When it comes to sticky, no-good, slipping, impossible-to-tune pegs, I've done my time. Yes, I do believe those are four completely different kinds of pegs! Not only did my early violin have problem pegs, but I also have taught scores of school children who were playing very cheap fiddles. And what makes a cheap fiddle cheap? One key ingredient is ill-fitting pegs. Pegs can cause problems in a variety of ways. Traditional pegs mostly cause problems if they don't fit the holes drilled for them in the peg box. Perhaps the holes are just old and weirdly worn. I believe that was the case with my German fiddle. Perhaps they never fit, because no one ever tried for that level of precision. Such is the case with cheap fiddles. But another reason they can "not fit" has to do with changing temperatures and humidity levels, which can throw the different woods of the pegs and peg box out of whack by making one expand or contract more than the other. Thus a change in the weather or climate can cause pegs to go wacky and either slip easily or get sticky and difficult to turn. There are several kinds of planetary pegs; she uses Wittner, but there are also Perfection Pegs by Knilling (which do require that they be glued in; Wittners do not). If you have serious problems with pegs, some kind of modern planetary pegs could be a pretty nice solution. At any rate, I am now curious about people's peg travails. I now have nice, workable pegs that are the traditional kind. But my struggles with bad pegs were a serious pain. And for a student, just learning to tune, it can be a major barrier. Where do you stand right now in relation to the pegs on the fiddle you most use? I find having fine tuners for all 4 strings will help w/ this to some extent -- that is, if the pegs are simply not staying put well enough for accurate tuning, but well enough to get you close so the fine tuners can take over. In such problem cases, I just swap for tail pieces w/ built-in fine tuners for all strings instead -- it's probably a good idea even if you have perfectly good, working pegs anyway. Wittner makes some very affordable (and light, composite-type) ones for this, if one doesn't mind their aesthetics. OR there are nicer looking, but more expensive, ones out there too. The only reason I could vote easy to tune was I had new traditional pegs installed last month. The originals were terrible. And yes this is an inexpensive German violin, but only about 25 year old. I agree that using fine tuners on all strings is extremely helpful. I've never had bad experiences with pegs on my violins, but I used to have a terrible time trying to tune my viola. My luthier told me that this is common among violinists learning to play the viola. My luthier put in the latest model of Planetry pegs, and now tuning is a breeze. In fact, I felt like calling my luthier and saying, "I have a problem with my viola. It never goes out of tune." 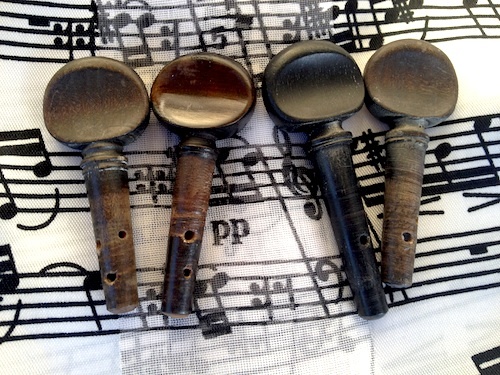 Laurie, the photo of your troublesome pegs is like a horror show for violinists. Tuning isn't easy, any a couple of my pegs re prone to slippage, but I quite enjoy the tuning. It makes me feel more 'in tune' (see what I did there?) with my instrument. I use Wittner tailpiece with built-in fine tuners, and am very happy with it. I have no plan to ever "grow up" and tune with pegs and an E fine tuner only, even though my pegs are just fine. My viola is a bit finicky: the G string likes to slip and I can never seem to get my D peg in the right position to turn easily. I also use a tail piece with built in tuners. I can tweak them during rests if needed, which is useful for the C string. Because of shoulder problems that make the angle/pressure of tuning viola really tricky, I have Wittner tailpieces with tuners on both violin and viola. However, I'm in discussion with my luthier about switching that system for perfections. I want the tuning back at the "proper" end of the instrument for one thing, and I want to see if/how the sound changes for another. If I don't like the planetary pegs, I can always go back to the tailpiece tuners; the only thing they limit me in is my choice of strings (another reason for trying the planetary route). I didn't vote because, with the tuners, I can tune fine. And my problem isn't the pegs anyway; it's me. Marjory, I think that you should consider using both fine tuners and Perfection pegs. I use them both on my violins and just the Planetary pegs on my viola. Interesting to learn that a violin at Stradivarius level has been fitted with planetary peg tuning! @ Pauline, I'm curious! What would be the advantage of both? Seems a bit like belt and braces. Laurie -- your violin beat my old German conservatory violin (which is now somewhat retired) by one style -- the original pegs in my violin covered three different styles instead of four. When I had them replaced I found nifty uses for the old pegs -- one on my key chain, one dangling from a bookmark, and two as pendants. My two current violins have very decent pegs -- I should probably find some wood to knock on, but I'm going out on a limb (which I guess would take care of the wood quest) and say that they neither stick nor slip. I have fine-tuners on all four strings, so I use those to tune for a few days, and then set them back to neutral and tune with the pegs. This is working really well so far -- no matter what the surrounding humidity is. It's funny, the pegs look like extracted teeth or something! I have Peg-Heads. They couldn't be easier to tune. Traditional pegs are easy to use if they are well fitted. Worn pegs and peg holes just don't work. Great comments. However, those of us with multiple instruments might find it hard to give a straight answer. My main instrument, an 1800s German model, has Caspari pegs. The Caspari pegs aren't available any more: they required reaming out the peg holes to make them fit. Lots of folks report problems with Casparis, but mine have been bulletproof. Tuning is completely effortless, and they do not slip. Any pitch variation is due to the strings themselves. My secondary instrument is a modern Romanian one. It has standard pegs which slipped all the time, when new. I'd put it away in the case, then open it the next day -- and two or three pegs had completely let go. A little peg fitting put things right, so it's OK now. My budget Chinese cello came with pegs that were never fitted, just run into the holes. Some pegs don't even go in all the way. Now talk about hard to tune and hold the right pitch! @John, yes hard to answer when one has more than one violin. I have two violins and one has Knilling Perfection Pegs. That violin is very easy to tune (with zero fine-tuners). My other (better) violin is usually quite easy to tune with regular pegs (it's only six years old so the parts are still like-new), but in some kinds of weather (dry winter weather, even with "humidity control in my case") I find when I open my case a couple of pegs have slipped and then I have to re-tune a lot for that practice session. So this violin also will get Knilling pegs. I had Caspari pegs on a violin which I no longer own and I'm afraid they were a nightmare! I'm sure they have improved since the 70s -- at least I hope. At a certain point, it just became impossible to tune the instrument because they stopped working and there was no recourse! This made me VERY wary of mechanical pegs, but it sounds like the Wittner, the Perfection and maybe even the Casparis, are a big improvement over the ones from years past.